These quick and easy Vegan Peanut butter and Date Overnight Oats are ideal for anyone who likes to meal plan and wants to get ahead! If you’re not familiar with the concept of overnight oats then maybe you’re familiar with bircher museli? Both are a breakfast dish made with oats that have been soaked overnight. Traditionally bircher museli was made with lemon or apple juice and topped with yogurt. Overnight oats are often soaked in milk rather than fruit juice to make them extra creamy! To make this breakfast suitable for a plant-based diet all I’ve done is swap cows milk for oat milk. You could use any other dairy free milk you have but I’m a huge fan of OATLY whole milk so we always have a carton of it in the fridge. It’s perfect in hot drinks and, of course, overnight oats! You’d also ordinarily find natural yogurt in an overnight oats recipe but I’ve just replaced it with Alpro plain yogurt. Their almond version is also delicious. I’ll admit I do have a bit of a sweet tooth so as well as adding dates to my overnight oats I do occasionally drizzle over a spoon of maple syrup too! But that’s optional. The peanut butter brings something more savoury to the dish. Be careful when choosing your peanut butter as some are packed full of sugar and other weird and wonderful ingredients. I like to use Meridian peanut butter; its organic and has a rich, roasted flavour! For added crunch I like to roughly chop some peanuts to sprinkle on top. If you’re a fan of mixing sweet and salty (a flavour combination I LOVE) then don’t be afraid to use lightly salted peanuts for your topping. A few more chopped dates and a sprinkling of cinnamon finished this recipe off nicely! I’ve listed the ingredients to make just one portion below but you could easily multiply it by 5 and have a portion of overnight oats for every day of the working week. Can you think of a better way to start your day? The night before, place the oats, 100ml of oat milk and the salt in a bowl. Cover and leave the oats to soak up the milk. In the morning, loosen the oats with the remaining milk until you have your desired consistency. Add the peanut butter, half the dates, half of the maple syrup (optional), half of the yogurt and stir. 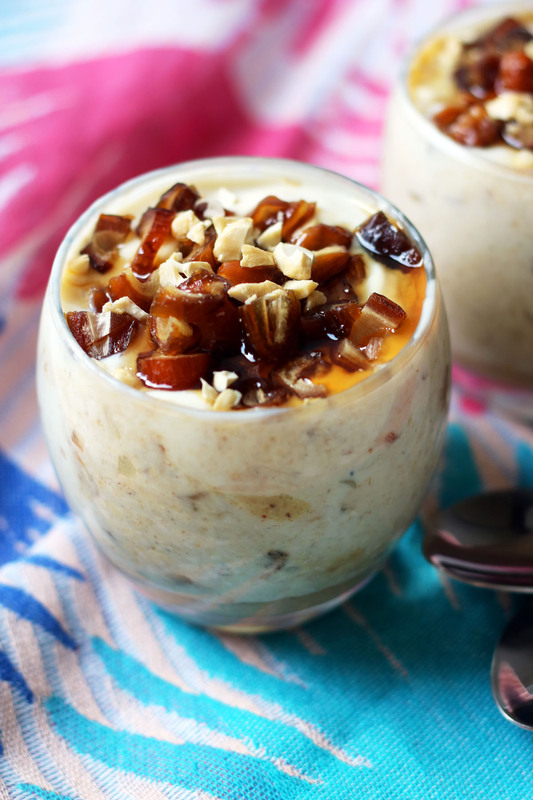 Top with the remaining yogurt, dates and the chopped nuts. Drizzle over the remaining maple syrup (if using) and dust with the cinnamon. If not eating immediately, cover and keep in the fridge for up to 5 days. If you follow me on Instagram you will see me absolutely raving about my new overnight oats jar. You can pick one from Amazon for less than £10! Do it, it will change your life! I need to hop on the trend of overnight oats– this looks like a great way to start my day! I definitely have more time in the evenings to plan out breakfast for the next day. Overnight oats are a great solution! These peanut butter and date overnight oats look like a perfect breakfast for the week. I love that I can make a big batch of this and eat on it all week making my mornings so much easier. I just love oatmeal and peanut butter! this is such a great recpe! easy and delicous! ready for those busy mornings! I am really loving overnight oats lately- so simple to throw together and it makes breakfast so much easier! The date and peanut butter combo sounds so delicious! Doesn’t it just! I had these for breakfast again this morning. Was so happy when I woke up late and remembered they were waiting for me in the fridge. Love that you added dates too the flavor combination is a winner. I could eat this as dessert too, so yummy! I’m a sucker for sweet breakfasts but you’re right it could be a pudding too! I’m not a morning person but I would wake up early to eat this! Delish! I’mnot really a morning person either which is why its so handy having breakfast made the night before!